My daughter and I picked over a gallon mulberries yesterday. I ate the first ripe one I picked the day before and my husband mowed all around it so we didn’t have to wade through too-tall grass. But after washing them my daughter noticed tiny bugs all over them. We gave them a vinegarand water bath and washed them again, but they just weren’t as appetizing any more after seeing that. I searched for a verse to share today and found one about which insects are okay to eat. No thank you! I am thankful for our fresh fruit though. I love having fresh fruit that I can pick from our own yard. How wonderful to have fresh fruit to eat. May you enjoy them all the more because of the work to pick and wash them free. Blessings! I've never had a mulberry before! They look a lot like a marionberry. 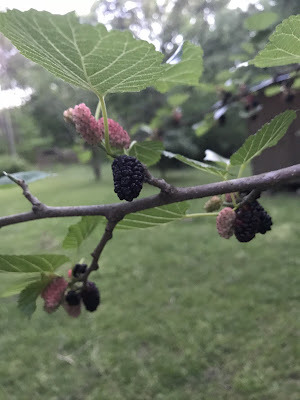 I miss having a mulberry tree in my yard! They sound so good right now! It's hard to imagine mowing and fruit growing when we're in the middle of a blizzard and we still have 30+ inches of snow on the ground! Seriously nice memories you're making with your daughter, though - despite the bugs!